Get your kids in the spirit with some really fun and festive DIY Thanksgiving decorations kids can make! Colorful and fun crafts that can be a great way to decorate your home for the holidays or gift to loved ones. I hope you and your little ones can enjoy these Thanksgiving DIY decorations as much as we do in our home. Minimal craft supplies are needed for the Thanksgiving kid crafts listed below. Grab your supplies or head to a craft store and grab what you need to get to crafting. I love all the fall colors and Thanksgiving-themed crafts below. I love the idea behind creating a thankful tree. You can have your kids help create the thankful tree and decide what to write on each leaf. It is a great way to see all the things they look at and are thankful for. Here is a very simple but colorful Thanksgiving craft to make. These would be really fun to use to decorate your table at Thanksgiving or give to neighbors, classmates, or family members. Let your kids help decorate your table with these fun napkin rings. A very fun and creative idea to create a table setting that has each person’s name. Head outdoors and find some pinecones and create little turkeys with some colorful leaves and eyes. Or head to your local craft store if you can’t find any in your neighborhood. Basic craft supplies needed to create one of a kind art that you can put on display through the holiday season! What a special art piece to have to share with guests as they come over to celebrate the season. I love the simplicity of this pumpkin craft, it is really fun to make and is pretty. Use these pumpkins to use as tabletop decor, hang on the wall, or even top goodie packages to hand out to neighbors. This is a really simple craft to make. The beauty of the coffee filter design is no two will look the same. This is a fun craft to make at preschool, daycare or on a rainy day at home. 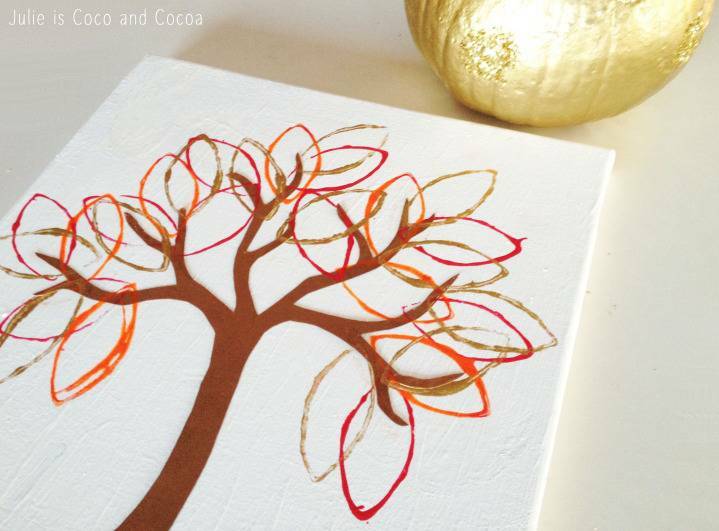 Here is a really glitter filled craft that will add a little sparkle to your decor. Plus you have feathers that are the outline of your little ones hands to make it an extra special decoration. This creative craft is so easy to do. A little glue, colored paper, and a free printable and you have really fun turkeys. Toss in a frame for wall decor for the home. I love a good paper plate craft, and this turkey one fits in with the Thanksgiving spirit. A really simple craft that even toddlers can enjoy the idea of making a homemade turkey. Have an old sock or two laying around? Transform them into adorable turkeys that will fit into the holiday. Or head to your local Dollar Tree and pick up some really cheap socks to use for this craft. What I like about this craft is it is similar to a puzzle. Your child will work to figure out the right pieces to place where. A really fun and creative craft they will enjoy. Here is where you can take a pumpkin and turn it into a turkey! A really creative craft, that allows them to enjoy a sweet treat at the end. They used an old bottle and painted it up and transformed it into Indian corn! I love the unique idea behind it to reuse a bottle and create a fun decor piece. These lanterns are fun, simple and easy to make. Head outdoors and find some fallen leaves to use to add that perfect touch of fall to your living room. Pilgrims are a big part of the season, so why not create a pilgrim hat with your kids. A really enjoyable craft all ages can enjoy. Depending on the age you might have to help with certain areas. Let all the members of your family and guests share what they are thankful for this year. Your kids can really enjoy helping to make a thankful box. Grab some felt and transform it into little unique and fun turkeys. Your child can work on their cutting skills when they cut out the print for the turkey feathers. What is your favorite craft to do with kids for Thanksgiving? YAY! $25 off $100 Coupon for NEW Target REDcard Members!